Much of Trump’s campaign rhetoric, embodied in his campaign slogan “Make America Great Again,” included a rejection of globalism, backed up by proposed policies of economic protectionism. Unfortunately, if these trade policies are “successful,” it will disproportionately impact the poor and working class, which is ironically a large portion of Trump’s core voting demographic. Dan Griswold, fellow at the Mercatus Center and co-director of their program on The American Economy and Globalization, states “Canada, Mexico, and China are the top three customers for U.S. exports.” Conversely, those economies are the top three Trump has had unfavorable rhetoric towards in regards to free trade. While the Trans-Pacific Partnership is by no means perfect, Daniel Ikensen of the Cato Institute’s Center for Trade Policy Studies argues in support of it in his analysis Should Free Traders Support the Trans-Pacific Partnership? An Assessment of America’s Largest Preferential Trade Agreement., going into detailed analysis on each of its thirty chapters. Concluding the agreement has flaws, such as built-in economic protectionism through some tariffs, expansion of state-owned enterprises, and examples of crony capitalism, Ikensen still supports the proposal. “Our conclusion is that it’s got some baked-in protectionism. There’s a lot of liberalization. On par, it’s net liberalizing. It will expand our economic freedoms. 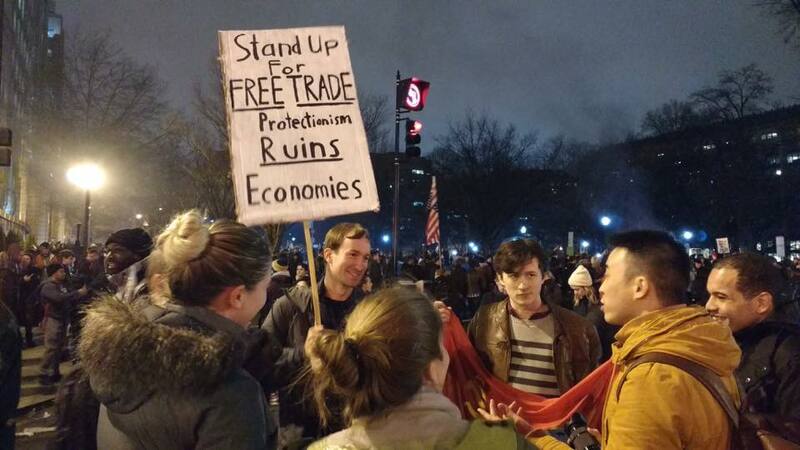 And my colleagues and I, my co-authors and I, support it.” In defending it, Ikensen supports its opening up of international markets and setting of 18000 tariffs to zero, essentially 18000 tax cuts. If anything, Trump’s rejection of the TPP would likely have the consequence of making us less competitive against China, as TPP opens U.S. markets to China’s East Asian competitors, while strengthening our geopolitical relationships with the region. If our upcoming Congress or Trump chooses to ultimately reject TPP, the vacuum of economic leadership could be filled by China, which would be counter to U.S. interests. The expansion of freedom of trade arguably helps the poorest Americans most. Expanding markets internationally increases competition more globally, leading to lower prices in the long run. Producers with lower amounts of capital can then afford certain products more easily that they may have been priced out of were it not for the expansion of international markets. And, needless to say, consumers benefit the most. Republican Senator Mike Lee, in an effort to limit Trump and future President’s executive power, has proposed a bill titled the “Global Trade Accountability Act” in light of concern over a Trump administration’s potential impact on global trade. Citing the negative impact tariffs would have on the economy, the bill would aim to limit the president’s wide-ranging powers to impose tariffs, and potentially require the President to go through Congress to use tariffs. Even Speaker Paul Ryan has stated his intent not to raise tariffs, contrasting with Trump on another key issue. If President Trump truly wants to grow the economy and raise prosperity for the most vulnerable Americans, he’ll reassess his previous rhetoric and proposed policies when it comes to free trade. Otherwise, he may want to retroactively change his campaign slogan from “Make America Great Again” to “Make America Expensive Again”.